World Wide Web—Magdalena Ball and Carolyn Howard-Johnson are poetry partners who believe in letting their customers have their poetry in whatever flavour they want. Up to now their Celebration Series of chapbooks have been available in print, for Kindle and other readers. But now most (with more coming!) are available at Barnes and Noble’s Nook. Blooming Red, our unconventional chapbook of Christmas poetry will soon be available on Nook and so will our newest member of our inexpensive series that celebrates women called Deeper Into The Pond. Artists who have contributed artwork for the covers of our chapbook series are Vicki Thomas, May Lattanzio, and Jacquie Schmall. For more information on any of the chapbooks in this poetry series, contact either of the authors or visit media rooms at www.howtodoitfrugally.com or www.magdalenaball.com . Guest blog: What is Creative Expression to you? Exploring creativity and creative expression in the arts are catalysts for healing & therapy. Research by Professor Semir Zeki demonstrates that even looking at art stimulates our brains; creating the same chemical response as when we are in love. This is just further evidence that creative expression like art and writing may prove beneficial for those that are feeling down or depressed. It occurs to me some might wonder if being creative is something we are or something we do. I imagine trying means not doing but we all use our creative license differently. In reality, many of us may have to pull from our guts a word or image, while another may seem to pull it out of the air. In any regards, practice makes perfect. Since I am most interested in the healing aspects of Creative Expression, I write articles and book reviews for Global Healing Exchange at http://www.globalhealingexchange.net/index.php/component/search/?searchword=Joyce+white&ordering=&searchphrase=all. This is a good site for sending all kinds of healing articles like art therapy, poem therapy and articles about the psychology of man. There are even chat rooms and public forms of all kinds that welcome our questions and input. In a sense, we will never be able to stretch our wings and fly free as artists and writers, if we let supposed ownership keep us from gifting our uniqueness to others. It takes faith in us, our gifts and our Creator to move through mental blocks like fear, negativity and self-doubt. When it comes to writing, I think it is important we never write something that hurts your head or our heart. We need to take ourselves and our craft seriously whether we write once a week or every single day. Release is the magic word for creative expression. I'm thinking about white birds looking for white worms crawling around in white grass, all white bellies hungry for their prey cannot be seen, I'm thinking of white sea-caps on white rolling seas, and a white sailboat in distress, how would it be seen? How could we help? How would we rake white leaves on white grass? How would we learn with white chalk on a white chalkboard? We can live without many things around, but who can happily and safely live without colors like red, yellow, blue, green and brown? It is our dark side that wants us to remain in the shadows instead of sparking light and love out into the world. Even if our dark side tells us we are bad or bad at what we are doing, we must fight for being “bad” with conviction and trust your innate needs. It is good to remember there is a crack in everything; and that is how the light gets in. We are all artists from the inside out. We creative beings must remember we can predestine failure when we give it power over us before it even happens. It is ironic our human bodies sometimes have difficulty knowing what is imagined and what is real. Carolyn Howard-Johnson and I am excited to announce the winner and runners-up of our first ever contest for cover art of their poetry chapbooks. 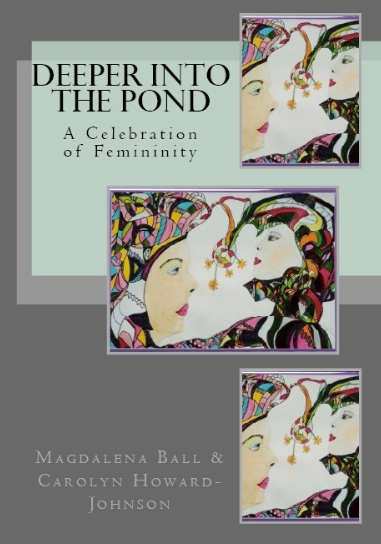 When published in July of 2011, Deeper into the Pond will celebrate, support, and inspire women. Jacquie Schmall’s winning entry reflects the powerful energy of women in the process of co-creation. Thus it seemed an ideal image for a chapbook that has resulted in this, the fifth in our award-winning series. Schmall, who lives in San Diego, developed a style she calls “rainbow geometry.” After spending time in theatre productions, and on film sets, she was compelled to paint a series of watercolors reflecting the powerful energy of women. The selected painting is one of them; it will be reflected in three iterations on the cover. The chapbooks in the Celebration Series include Cherished Pulse (for anyone you love), with artwork from California artist Vicki Thomas (www.budurl.com/CherishedPulse); She Wore Emerald Then (for mothers on your gift list) with photographs by May Lattanzio (www.budurl.com/MotherChapbook); Imagining the Future: For Fathers and Other Masculine Apparitions (for the men in your life) (www.budurl.com/Imagining); and Blooming Red, a celebration of Christmas (www.budurl.com/BloomingRed), also featuring Thomas’s work. Runners up in the contest are Roxanne Kahan and Cynthia Uhrich. For more information on any of the chapbooks in this poetry series, contact either Carolyn or me, or visit media rooms at http://www.howtodoitfrugally.com or http://www.magdalenaball.com. To learn more about artist Jacqui Schmall and to see her selections of her work, go to http://jacquie-pleasecallmelater.blogspot.com/2011/06/paintings-by-jacquie.html. It's nearly Father's Day (in the US, where my own father lives). To celebrate, I thought I'd put up another of my poems from the poetry book Imagining the Future that Carolyn Howard-Johnson and I wrote, followed by a lovely review that was just posted on Amazon this morning. in that wicked way of the mind. Carolyn Howard-Johnson's grandson served two tours in Iraq. Her husband is a retired Army officer who served in the 1960s Berlin call up. I can hear the sober sounds of the National Anthem in the background of all her poetry, with the throat voice of Uncle Sam warning, “I want him. He’s mine. You can’t have him!” All wives and little girls cry. Carolyn Howard Johnson and Magdalena Ball have written a wonderful little memoir celebrating Father’s Day and all their sacrifices as girls and women growing up in the 50’s and together they swam through a remembered past. I recommend this little gem and I give it Five Stars for Amazon. Happy Father’s Day to all…wives, children and our husbands who take care of our very basic needs while we write poetry. "The gliding brilliance of his voice..."
If this isn't enough to completely endear you to both Joyce and Frank Delaney (c'mon), drop by Delaney's Re:Joyce: http://blog.frankdelaney.com/re-joyce/ for the most delicious taste of Ulysses , every Wednesday, for the next twenty-two years. Yes. Today's guest blog is a little different from the usual book faire. Martha Swirzinski is an author, and her children's books, Leap...Laugh...Plop and Guess...Giggle...Wiggle are all about movement and activity, so she's dropped by to talk to us about how to keep children active. Take a nature hike – name the colors you see, pick up trash for a more pleasant environment, count different types of plants, move like the animals you see. Read- take a walk to the library, pick books that encourage movement throughout the story. Play- Try some of the classic games like Red Rover, Red Light/Green Light, Hopscotch, Tag, Charades, or 4 Square. Dance- turn on the music and DANCE!! No one is watching so be silly and have fun! When you go to the park with your child be active with them and have fun playing. Take your children places that encourage walking: Zoo, botanical gardens, beach, museums, and parks. Teach children about personal space. Have each child extend their arms to the side and turn slowly in a complete circle. Make sure the arms of one child do not touch the arms of another child. Use the concept of freeze. Play areas are often noisy so use your outside voice and yell freeze. Teach the children that when they hear the word freeze they immediately hold the pose that they are in. You can then have them sit down and regain their personal space. Be sure that the proper fitting safety gear is worn for the activity. Hydrate, hydrate, hydrate. Drinking water is important when children are exercising, especially when it is hot. The Centers for Disease Control recommends 10 ounces every 15 – 20 minutes. Martha received her Masters Degree in Kinesiology from the University of Maryland at College Park. She collaborated with Dr. Anita Tieman, a mental health therapist, to develop a series of books titled Movement and More. These three books, the fourth is on its way, are perfect for babies all the way to grade school children. Using entertaining rhymes and charming pictures, these developmentally based books offer fun and creative ways for your child to move while also providing mind stimulating activities on each page. Each book focuses on a specific set of movement skills. By just reading the book, children can engage in fun and exciting movement as well as enhancing other mind/body skills. Designed to be enjoyed again and again, the pages of these books are filled with laughter, learning, movement and more. Drop by Kevin McNamee's blog tomorrow for another great Writers on the Move interview with Mari Taylor.